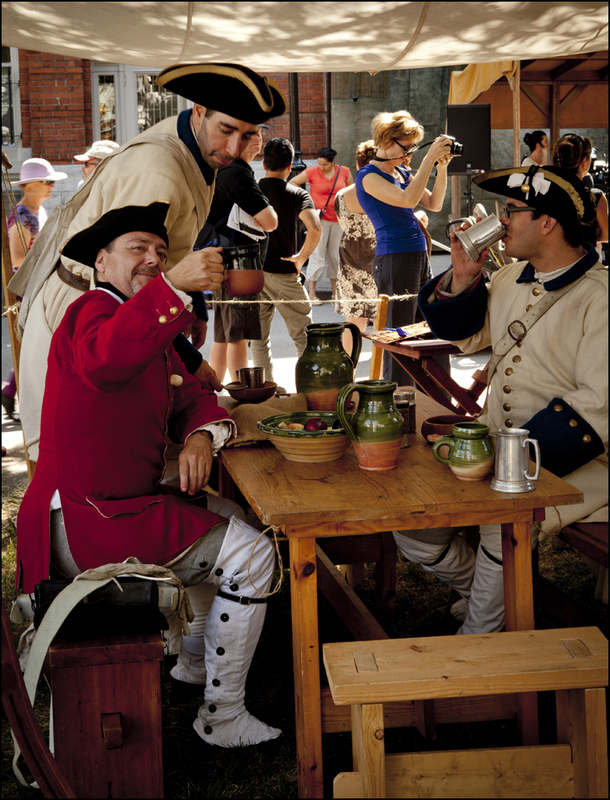 Just back from yesterday’s event at the Pointe-a-Calliere museum in old Montreal. 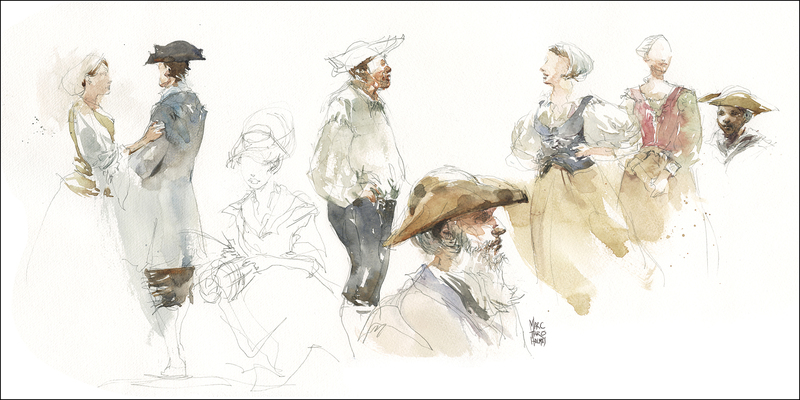 A big group of USk:MTL sketchers came out to draw the costumed re-enactors at the 18th century public market. 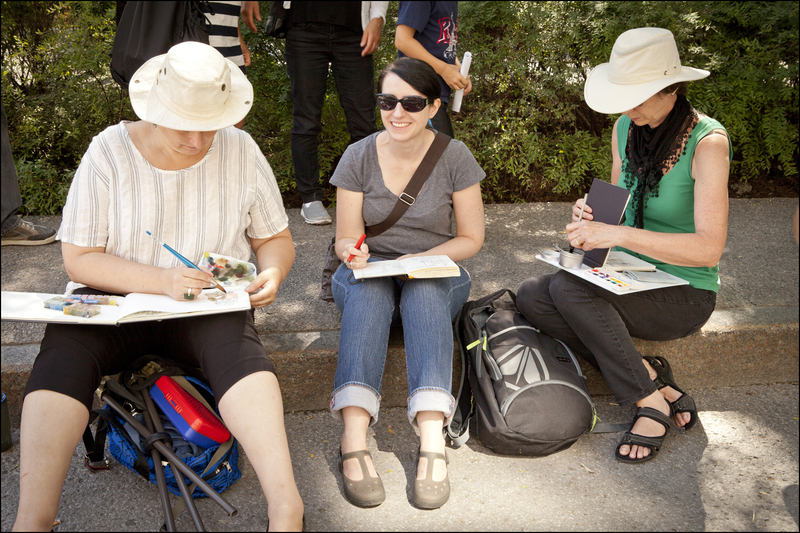 We had great weather for drawing and plenty of subject matter. Musicians and merchants, potters and soap makers, sea captains taking on crew, pirates dodging soldiers, and the black-robed priest chastising tourists about their immodest clothing. 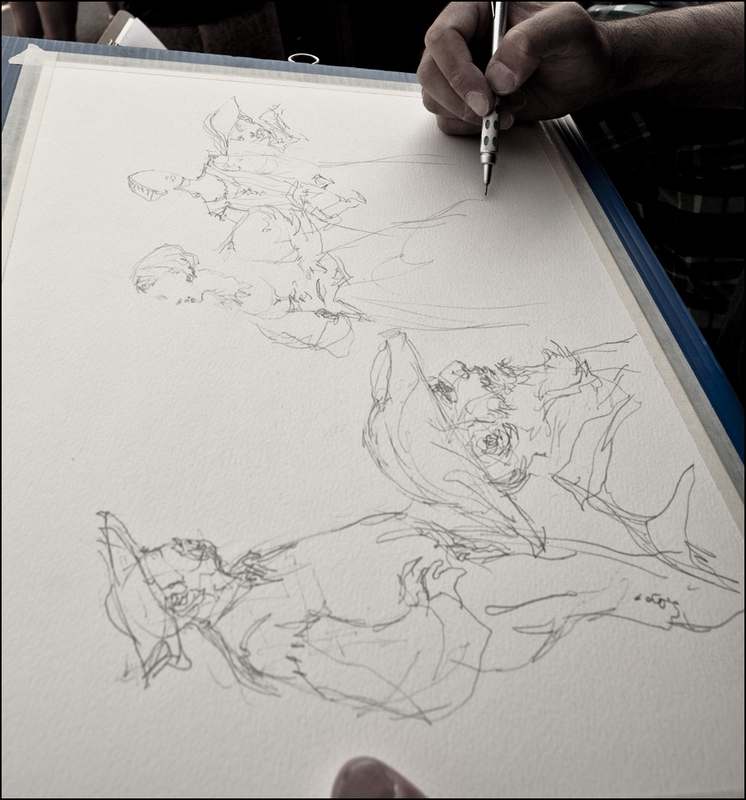 If you’re in Montreal on a fourth Sunday, we hope you’ll look up our sketching plans at the USK:MTL blog. Everyone is welcome! Looks like a lot of fun. Sorry I missed it! What a beautiful use of color in these two pieces! Loks like a fun place to sketch! Great job on all the characters and costumes. I am so inspired to go to the next medieval market in my part of Europe right now. Your 18th century market looks very fancy, especially in your sketches! Both your photography and your sketches are beautiful. Congratulations on a well-done blog. i follow Shari’s blog and that leads me to yours..
both amazing artists Shari and you. do you have workshop outside of Montreal? i mean like closer to Australia? i asked Shari the same questions.. how i wish i could do Shari’s and your workshop. i am going to get the dancer drawing print you have on Etzy..
Hey Rooi :) Thanks for stopping by. I would love to go see AUS – Not sure how I’d get down there – possibly we do need to organize a workshop to pay the freight. But if you’re in Sydney you could see about taking something with our friend Liz Steele? http://www.lizsteel.com/ I highly recommend drawing with her sometime. It’s great watching her work. She’ll open your eyes to how spontaneous and exciting sketching can be. 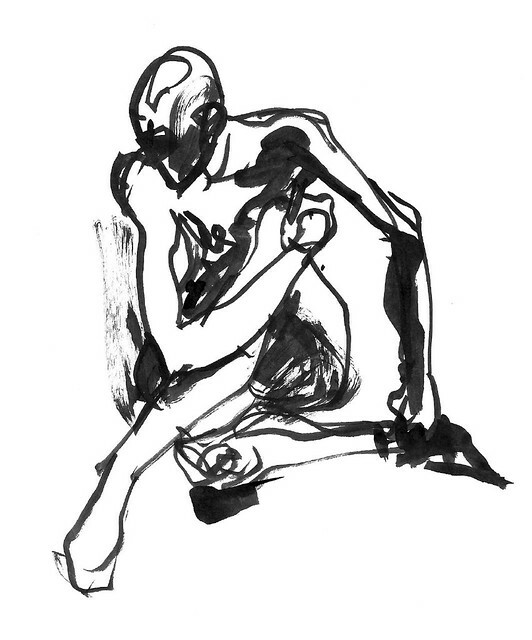 Drawing people: here’s the trick – about 6 months of 5 min life drawing poses! When I decided to get serious about drawing, there was a two or three year period where I went to short-pose figure drawing classes as often as I could – about 2 times a week, sometimes more. It’s the best training possible. Doing lots of 3-5 min poses keeps you learning at a good pace. I did a couple of terms with Erin Hills and she often talks about Liz and her workshops.. I shall check them out. checking out your works on flickr definitely flare up the flame..
please do plan to come to land of oz.. brilliant weather i promise you. I might still save up to visit montreal next or year after.. you never know! then I can take classes with both Shari and you.. 2 stones in 1 go.